On 26th May 2014 Narendra Modi took oath as the Prime Minister of India, becoming the first ever PM to be born after India attained Independence. Dynamic, dedicated and determined, Narendra Modi reflects the aspiration and hope of over a billion Indians. Ever since he assumed office in May 2014, PM Modi has embarked on a journey of all-round and inclusive development where every Indian can realize their hopes and aspirations. He remains deeply inspired by the principle of ‘Antyodaya’, of serving the last person in the queue. Through innovative ideas and initiatives, the Government has ensured that the wheels of progress move at rapid pace and the fruits of development reach every citizen. Governance has become open, easier and transparent. In a first, the Pradhan Mantri Jan Dhan Yojana marked a paradigm shift in ensuring that every citizen is integrated in the financial system of the Nation. His clarion call for ‘Make in India’ complimented by a focus on making business easy has stimulated unprecedented vigour and enterprise among investors and entrepreneurs. Labour reforms and dignity of labour under the ‘Shrameva Jayate’ initiative has empowered several workers of small and medium industries, also providing a boost to our skilled youth. In a first, the Government of India launched three social security schemes for the people of India and also focused on giving pension to the elderly and insurance cover to the poor. 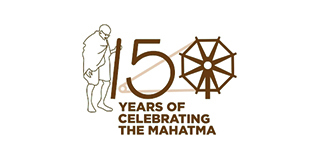 In July 2015 the Prime Minister unveiled the Digital India Mission to create a Digital India where technology plays a key role in bringing a qualitative change on people’s lives. 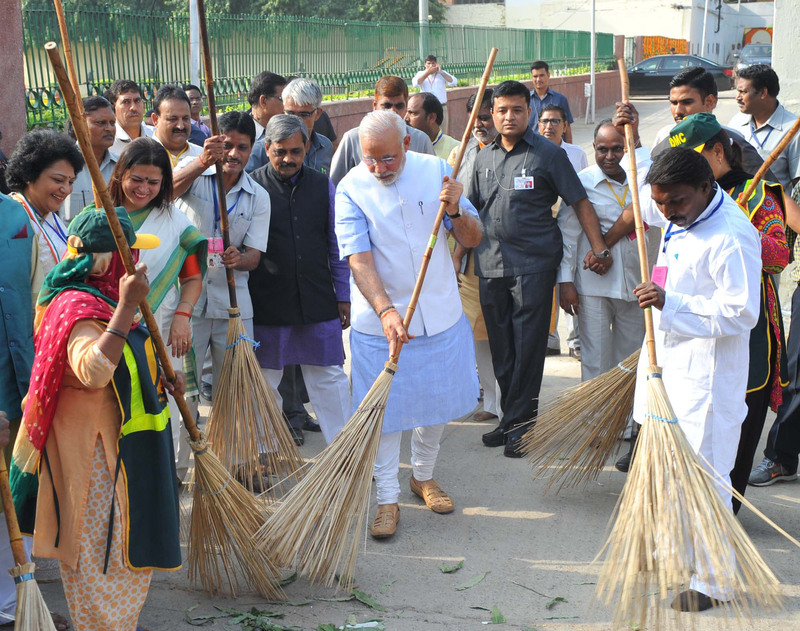 On 2nd October 2014, Mahatma Gandhi’s Birth Anniversary the PM launched ‘Swachh Bharat Mission’ a mass movement for cleanliness across the Nation. The scale and impact of the movement is historic. Narendra Modi’s foreign policy initiatives have realized the true potential and role of world’s largest democracy, India on the world stage. He began his term in office in presence of all Heads of States of SAARC Nations. His address to the General Assembly of United Nations was appreciated across the world. Narendra Modi became the first Indian Prime Minister to embark on a bilateral visit to Nepal after a long period of 17 years, to Australia after 28 years, to Fiji after 31 years and Seychelles after 34 years. Since taking over, Narendra Modi attended UN, BRICS, SAARC and G-20 Summits, where India’s interventions and views on a variety of global economic and political issues were widely appreciated. His visit to Japan marked a momentous chapter to unfold a new era of India-Japan relations. He became the first PM of India to visit Mongolia and his visits to China and South Korea have been successful in drawing investments to India. His continued engaging with Europe was seen during his visit to France and Germany. Shri Narendra Modi has attached great importance to strong ties with the Arab world. His visit to UAE in August 2015, the first by an Indian PM in 34 years, covered tremendous ground in enhancing India’s economic partnership with the Gulf. In July 2015 Shri Modi visited the five central Asian Nations in a visit that was seen as path breaking. Vital agreements were signed between India and these nations in spheres like energy, trade, culture and economics. In October 2015 a historic India Africa Summit was held in New Delhi, in which 54 African nations participated. Leaders of 41 African nations graced the summit, in which extensive deliberations on deepening India-Africa ties. The Prime Minister himself held bilateral meetings with the visiting African leaders. In November 2015 the Prime Minister joined the COP21 Summit in Paris, where he, along with several world leaders deliberated on climate change, Shri Modi and President Hollande of France unveiled the International Solar Alliance, a forum to harness energy of the Sun to light homes. In April 2016 the Prime Minister joined the Nuclear Security Summit where he put forth a strong message on the importance of Nuclear Security at the world stage. He visited Saudi Arabia, where he was conferred the highest civilian honour of Saudi Arabia Sash of King Abdulaziz. Several world leaders including Prime Minister of Australia Tony Abbott, President Xi Jinping of People’s Republic of China, President Maithripala Sirisena of Sri Lanka, President Vladimir Putin of Russia and Chancellor Angela Merkel of Germany have visited India and these visits have achieved breakthroughs in improving cooperation between India and these Nations. The 2015 Republic Day saw President Barack Obama visit India as the Chief Guest, a first in the history of India-USA relations. In August 2015, India hosted the FIPIC Summit, which was attended by top leaders from the Pacific Islands. Key aspects relating to India’s ties with the Pacific Islands were discussed. Born on 17 September 1950 in a small town in Gujarat. The family belonged to the other backward class which is among the marginalized sections of society. He grew up in a poor but loving family ‘without a spare rupee’. The initial hardships of life not only taught the value of hard work but also exposed him to the avoidable sufferings of the common people. This inspired him from a very young age to immerse himself in service of people and the nation. In initial years, he worked with the Rashtriya Swayamsevak Sangh (RSS) a Nationalist organization devoted to nation building and later devoted himself in politics working with the Bharatiya Janta Party organization at National and State level. Shri Modi completed his MA in political science from Gujarat University. In the year 2001, he became the Chief Minister of his home State Gujarat and went on to serve a record four terms as Chief Minister. He transformed Gujarat, which was reeling from the after-effects of a devastating earthquake, into a growth engine that makes a strong contribution to India’s development. Narendra Modi is a ‘People’s Leader’, dedicated solving their problems and improving their well-being. Nothing is more satisfying to him than being amongst the people, sharing their joys and alleviating their sorrows. His powerful ‘personal connect’ with the people on ground is complemented by a strong online presence. He is known as India’s most techno-savvy leader, using the web to reach people and bring about change in their lives. He is very active on social media platforms including Facebook, Twitter, Google+, Instagram, Sound Cloud, Linkedin, Weibo and other forums. 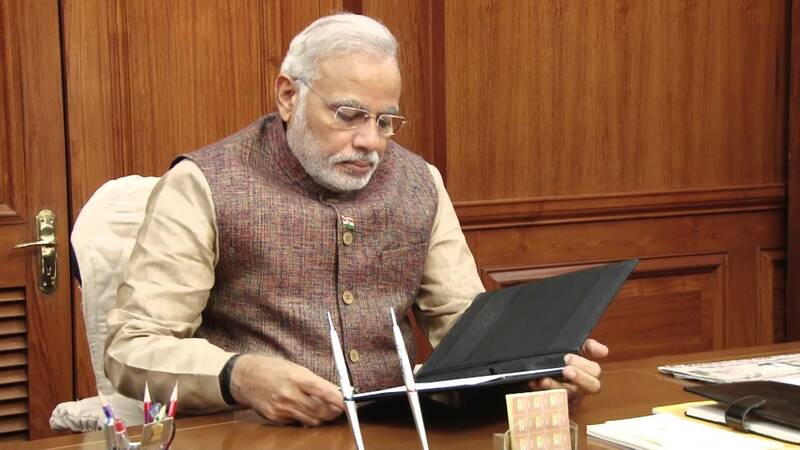 Beyond politics, Narendra Modi enjoys writing. He has authored several books, including poetry. He begins his day with yoga, which centers his body and mind and instills the power of calmness in an otherwise fast-paced routine. 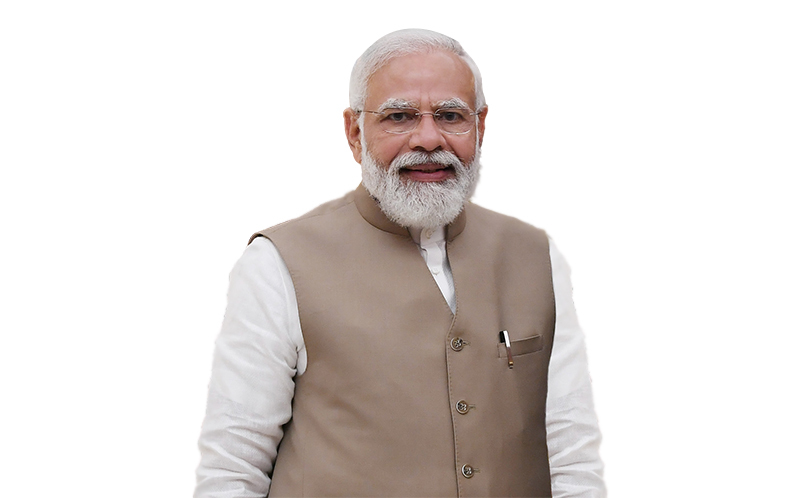 This is the man, an embodiment of courage, compassion and conviction, on whom the nation has bestowed its mandate, trusting that he will rejuvenate India and make it a bright beacon to the world.